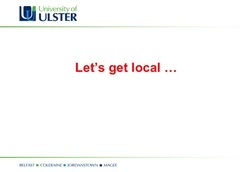 Having looked at some of the entrepreneurial folk who have and national and international reputation, the next batch of slides provides opportunities to describe, discuss and debate some of the issues in entrepreneurship in practice with some more local examples. 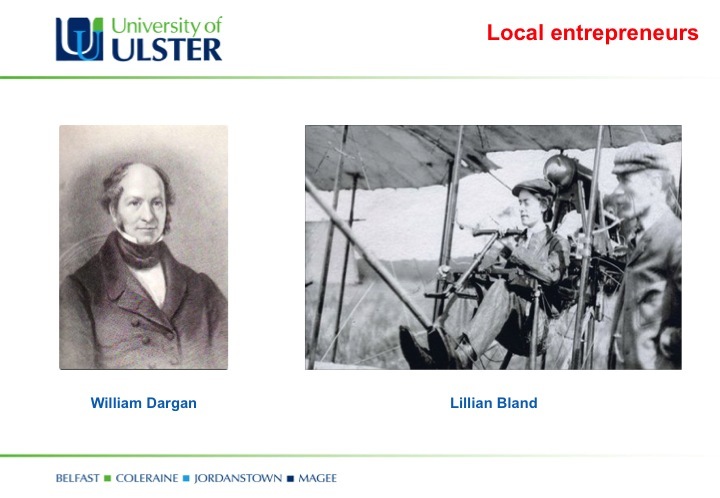 This short section of three slides introduces some class discussion around innovation and creativity among local people over the years who have made a significant impact on a global scale. Medicine – Frank Pantridge and the development of the defibrillator that is now available in public places on every continent. 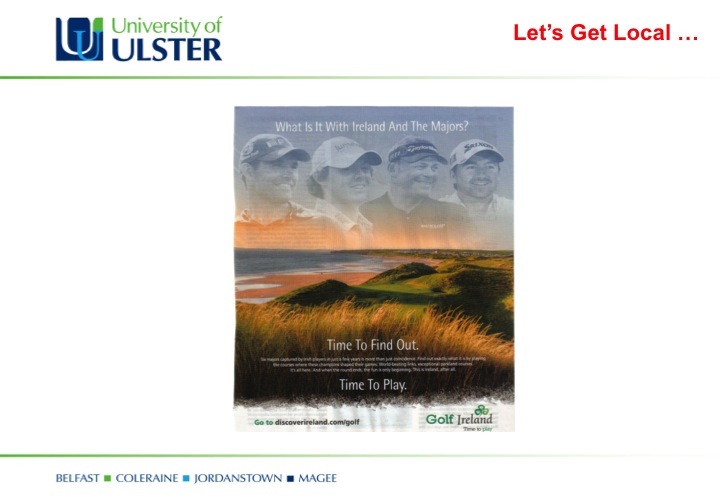 Sport, the arts and creative industries – Rory McIlroy, Graeme McDowell, Darren Clarke and Padraig Harrington all have world-class track records in just one sport. 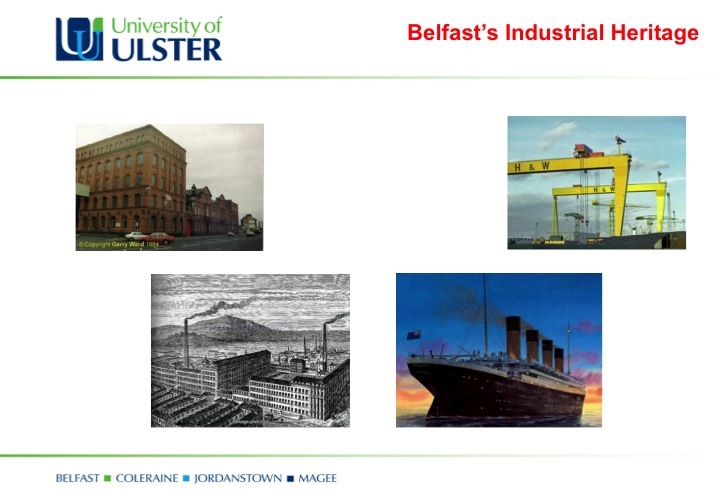 Using this slide gives me an opportunity to comment on the changing local economy in Belfast and the north of Ireland over the last hundred years, when shipbuilding, textiles and textile machinery, rope making and tobacco were all massive employers in the local community; there are still some traces of such economic activity but there is now much more in retailing, financial services and customer contact centres. 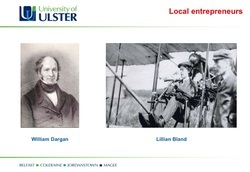 Lillian Bland of Carnmoney was an entrepreneurial engineer who designed, built and flew her own aeroplane over 100 years ago. 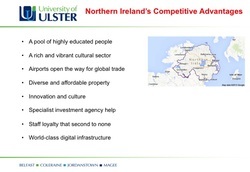 Based on the idea of industry clusters discussed by Michael Porter, I make use of an article that appeared in the Belfast Telegraph to identify eight ideas which can be a source of competitive advantage for Northern Ireland. Optional: Read this article from The Economist. 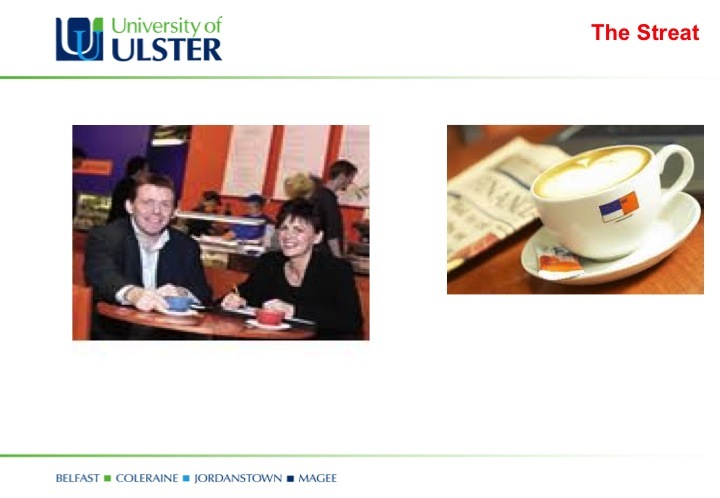 Nikki McQuillan and her husband Michael developed The Streat as a franchised business; it has been recently sold to the Henderson Group. 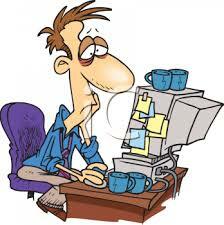 Franchising is a business model that is well suited to the needs of some sectors of the economy. This is an innovative and creative Belfast based company, run by a graduate from the University of Ulster. 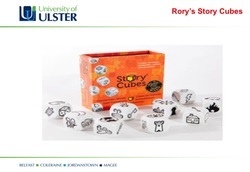 Little pictures on the faces of dice are used them to generate ideas, link them and create stories. 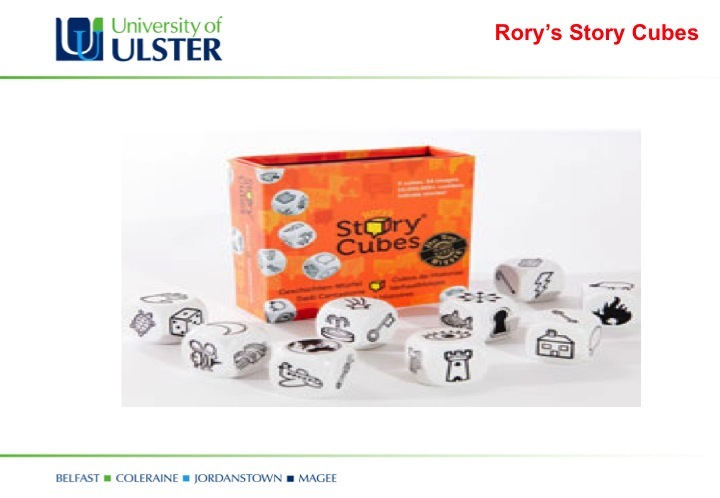 They are also good for management development and training: 9 cubes, each with 6 faces with a picture on them, produce threads can be developed into a topic for discussion. 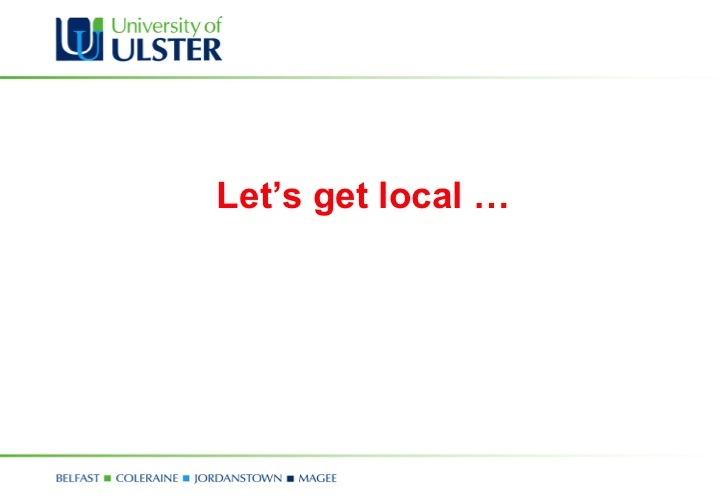 The original idea is now available in various versions; for example, to practise verbs in any language and to teach geography. 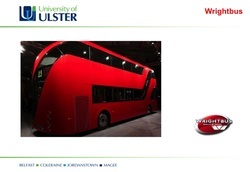 Wrightbus is another example of a small business which expanded and has seen sustained growth for a number of decades now. Many of the iconic London bosses are now manufactured in Ballymena. Originally set up in 1946, there has been a considerable amount of media attention featuring Boris Johnson, Lord Mayor of London, on his occasional visits to Ballymena to see these buses in production. The company has a contract to supply London buses to a number of other countries, with flat pack buses which contain the fabric of the bus, the engine is supplied separately. 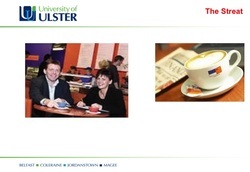 The company currently employs over 1,700 people in a sustainable business. 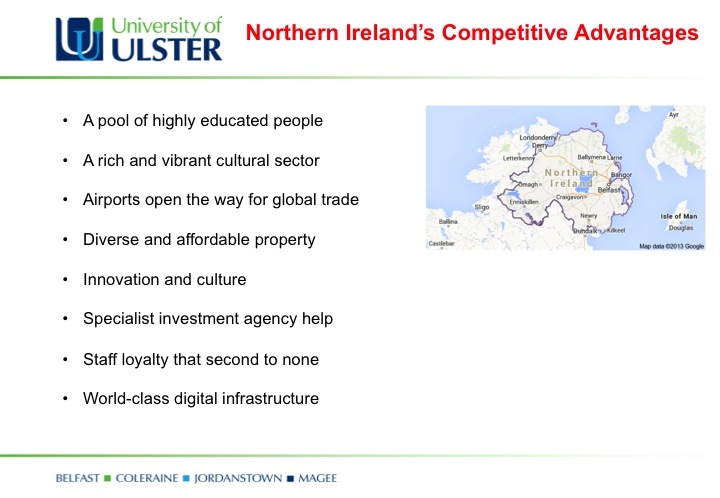 Can you provide any additional examples of companies, organisations or individuals who have made significant contributions to the local economy through creative thinking and entrepreneurship?